HONG KONG — China's exports fell back into contraction last month, signaling renewed weakness for the world's second biggest economy as it faces possible trade tensions under Donald Trump's presidency. Customs data posted Friday showed that exports shrank 6.1 percent to $209.4 billion in December compared with the year-ago period. The latest numbers mark a return to a long term downward trend amid tepid global demand. 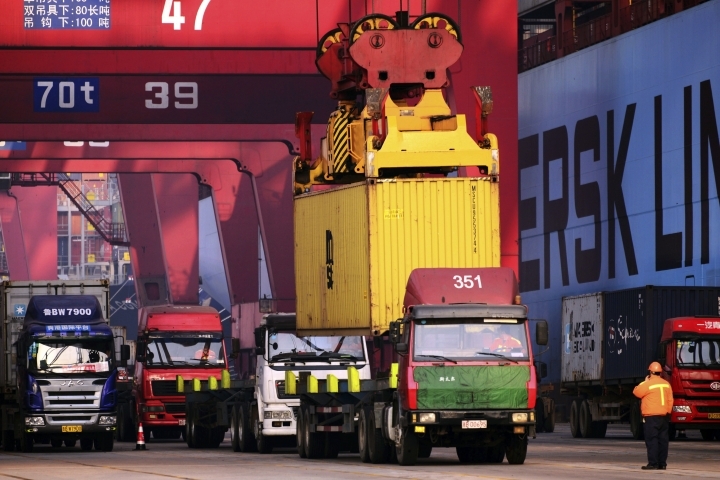 In November, China's exports eked out a 0.1 percent expansion after shrinking for nine straight months. In a sign of lackluster domestic demand, imports rose 3.1 percent to $168.5 billion, slowing from a 6.7 percent rise the month before and leaving a trade surplus of $40.8 billion for the month. The figures cap a dismal year for Chinese trade, with combined imports and exports contracting 6.8 percent. For 2016, China's trade surplus amounted to $510 billion, according to the figures released by the General Administration of Customs. Slumping trade adds to pressure on China's communist leaders trying to shore up weakening growth in the economy. China's top economic planner said earlier this week the economy is estimated to have expanded by about 6.7 percent last year. Those figures, which will be confirmed when fourth-quarter data is released Monday, are within the official target range of 6.5 to 7 percent but down sharply from double-digit growth half a dozen years ago. "China is lagging behind the recent improvement in Asian exports and thus the country's trade outlook will remain challenging in 2017," Betty Wang and Raymond Yeung of ANZ Bank said in a report. "Sluggish global demand and anti-globalization sentiment will continue to cloud Asia's export outlook, including China's." China's trade woes may worsen after U.S. President-elect Donald Trump takes office next week. Trump, who railed about America's big trade deficits during his campaign, has accused China of unfair trade practices and threatened punishing tariffs. "Trump's trade policy will likely motivate U.S. businesses to move their manufacturing facilities away from China, although the latter's efforts in promoting high-end manufacturing may offset part of the loss," Wang and Yeung said.